The assassination of John F. Kennedy, the thirty-fifth President of the United States, took place on Friday, November 22, 1963, in Dallas, Texas, USA at 12:30 p.m. CST (18:30 UTC). Kennedy was fatally wounded by gunshots while riding with his wife in a presidential motorcade through Dealey Plaza. An official investigation by the Warren Commission was conducted over a 10-month period, and its report was published in September 1964. The Commission concluded that the assassination was carried out solely by Lee Harvey Oswald, an employee of the Texas School Book Depository in Dealey Plaza. This conclusion initially met with widespread support among the American public, but polling in recent years shows a majority of that public now hold beliefs contrary to the Commission's findings. The House Select Committee on Assassinations (HSCA) concluded in 1979 that Kennedy was probably assassinated by Oswald as a result of a conspiracy. This conclusion was based on taped acoustic evidence, that has since been called into question. The assassination is still the subject of widespread speculation, and has spawned a number of Kennedy assassination theories. Kennedy had chosen to visit Dallas on November 20 for three main reasons: to help generate more Democratic Party presidential campaign fund contributions in advance of the November 1964 presidential election; to begin his quest for re-election; and, as the Kennedy- Johnson ticket had barely won Texas (and had lost Dallas) in 1960, to mend political fences among several leading Texas Democratic Party members who appeared to be fighting politically amongst themselves. There were concerns about security because as recently as October 24, U.S. Ambassador to the United Nations Adlai Stevenson had been jeered, jostled, struck by a protest sign, and spat upon during a visit to Dallas. The danger from a concealed sniper on the Dallas trip was also of concern. President Kennedy himself had mentioned it the morning he was assassinated, as had the Service agents when they were fixing the motorcade route. Sgt. Davis, of the Dallas Police Department, had prepared the most stringent security precautions in the city's history, so that the demonstrations like those marking the Stevenson visit would not happen again. But Winston Lawson of the Secret Service, who was in charge of the planning, told the Dallas Police not to assign its usual squad of experienced homicide detectives to follow immediately behind the President's car. This police protection was routine for both visiting presidents and for motorcades of other visiting dignitaries. Police Chief Jesse Curry later testified that had his men been in place, the murder might have been prevented, because they carried submachine guns and rifles to take out any attackers, or at least they might have been able to stop Oswald before he left the building. It was planned that Kennedy would travel from Love Field airport in a motorcade through downtown Dallas (including Dealey Plaza) to give a speech at the Dallas Trade Mart. The car in which he was traveling was a 1961 Lincoln Continental, open-top, modified limousine. No presidential car with a bulletproof top was yet in service in 1963, though plans for such a top were presented in October 1963. 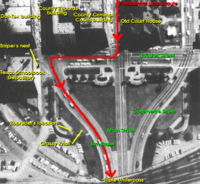 Just before 12:30 p.m. CST, Kennedy’s limousine slowly approached the Texas School Book Depository head-on, and then the limousine slowly turned the 120-degrees directly in front of the depository, now only 65 feet (20 m) away. When the limousine had passed the depository, shots were fired at Kennedy. During the shooting, the limousine is calculated to have slowed from over 13 mph (20 km/h) to 9 mph (15 km/h). The shooting took place on Elm street in front of the John Neely Bryan north pergola concrete structure in Dealey Plaza. A number of persons were near the assassination site on both sides of the street, but notably Abraham Zapruder was standing on the western pedestal of the pergola making a continuous film of the President as he passed below his position. At one point, he testified to the shock, disbelief, and then the horror of seeing the President murdered right in front of where he was standing. Secret Service agent Clinton J. Hill was riding on the left front running board of the car immediately behind the Presidential limousine. Sometime after the shot which hit the president in the neck area, Hill jumped off and ran to overtake the limousine. After the shot which hit the president in the head, Hill jumped onto the back of the limousine and clung to the car as it exited Dealey Plaza and sped to Parkland Memorial Hospital. There was hardly any reaction in the crowd to the first shot, many later saying they thought they had heard a firecracker or a car's exhaust backfire. Texas Governor John Connally, riding in the same limousine in a seat in front of the President, was also critically injured but survived. Doctors later stated that after the Governor was shot, Mrs. Connally pulled the Governor onto her lap, and the resulting posture helped close his front chest wound (which was causing air to be sucked directly into his chest around his collapsed right lung). James Tague, a spectator and witness to the assassination, also received a minor wound to his right cheek while standing 270 feet (82 meters) in front of where Kennedy was shot. The injury resulted from debris ejected when a bullet struck a nearby curb. Lee Harvey Oswald was arrested eighty minutes after the assassination for killing Dallas police officer J. D. Tippit. He was captured in a nearby movie theatre. Oswald resisted arrest, he was later charged with murders of Tippit and Kennedy that evening. Oswald denied shooting the president and claimed he was a patsy. Oswald's case never came to trial because two days later, while being transported to an armored car for holding in the Dallas County Jail prior to his trial, he was shot and killed by Jack Ruby. A 6.5 x 52 mm Italian Mannlicher-Carcano M91/38 bolt-action rifle was found on the 6th Floor of the Texas Book Depository by Deputy Constable Seymour Weitzman and Deputy Sheriff Eugene Boone soon after the assassination of President Kennedy. The recovery was filmed by Tom Alyea of WFAA-TV. This footage shows the rifle to be a Mannlicher-Carcano, and it was later verified by photographic analysis commissioned by the HSCA that the rifle filmed was the exact same one identified as the assassination weapon. A distinctive gouge mark and identical dimensions also identify it as the rifle in the Oswald backyard photographs. A bullet found on Connally's hospital stretcher was ballisticly matched to this rifle. The previous March, the rifle had been bought by Lee Harvey Oswald under the name "Alek James Hidell." A partial palm print of Oswald was also found on the barrel of the gun. The staff at Parkland Hospital's Trauma Room 1 who treated Kennedy observed that his condition was "moribund", meaning that he had no chance of survival upon arriving at the hospital. Dr. George Gregory Burkley, the President's personal physician arrived at the Parkland emergency room where the President was located, five minutes after the President arrived. Dr. Burkley observed both the head wound and a wound to the back of the President and determined the head wound was the cause of death. Dr. Burkley signed President Kennedy's death certificate. At 1:00 p.m., CST (19:00 UTC), after all heart activity had ceased and after a priest administered the last rites, the president was pronounced dead. "We never had any hope of saving his life", one doctor said. The priest who administered the last rites to Kennedy told The New York Times that the president was already dead by the time he had arrived at the hospital, and he had to draw back a sheet covering the president's face to administer the sacrament of Extreme Unction. Kennedy's death was officially announced by acting White House Press Secretary Malcolm Kilduff at 1:38 p.m. CST (19:38 UTC). Governor Connally, meanwhile, was soon taken to emergency surgery where he underwent two operations that day. A few minutes after 2:00 p.m. CST (20:00 UTC), and after a confrontation between Dallas police and Secret Service agents, Kennedy's body was placed in a casket and taken from Parkland Hospital and driven to Air Force One. The casket was then loaded aboard the airplane through the rear door, where it remained at the rear of the passenger compartment, in place of a removed row of seats. The body was removed before undergoing a forensic examination by the Dallas County coroner, which violated Texas state law (the murder was a state crime, and occurred under Texas legal jurisdiction). At that time, it was not a federal offense to kill the President. Vice President Lyndon B. Johnson (who had been riding two cars behind Kennedy in the motorcade through Dallas and was not injured) became President of the United States upon Kennedy's death. Johnson took the oath of office on board Air Force One just before it departed Love Field. After Air Force One landed at Andrews Air Force Base, just outside Washington DC, Kennedy's body was taken to Bethesda Naval Hospital for an immediate autopsy. The autopsy (about 8 to 11 p.m. EST Nov. 22) was followed by embalming and cosmetic funeral preparation (about 11 P.M. to 4 A.M.) in the morgue at Bethesda, in a room adjacent to the autopsy theatre. This was done by a team of private mortuary personnel, who made an unusual trip to the hospital for this procedure, not ordinarily done there. The body, prepared for viewing, was then placed in a casket for transportation to Washington, D.C. The autopsy report said the defect extended into the right temporal and occipital regions of the skull. The report addressed a second missile which "entered Kennedy's upper back above the shoulder blade, passed through the strap muscles at the base of his neck, bruising the upper tip of the right lung without puncturing it, then exiting the front (anterior) neck," in a wound that was destroyed by the tracheotomy incision. This autopsy finding was not corroborated by the President's personal physician, Dr. Burkley, who recorded, on the death certificate, a bullet to have hit Kennedy at "about" the level of the third thoracic vertebra. (Image) Supporting this location along with the bullet hole in the shirt worn by Kennedy, (Image) and the bullet hole in the suit jacket worn by Kennedy (Image) which show bullet holes between 5 and 6 inches below Kennedy's collar. (Image). However, photographic analysis of the motorcade shows that the president's jacket was bunched below his neckline, and was not lying smoothly along his skin, so the clothing measurements have been subject to historical criticism as being untrustworthy on the matter of the exact location of the back wound . Dr. J. Thornton Boswell's face sheet diagram from the autopsy sheet is sometimes used to support a lower back wound (Image). However, in 1966 Boswell himself noted that this drawing was never intended to be scale-exact, and he re-drew it for the benefit of The Baltimore Sun in 1966 (Nov 25), placing an X at the higher spot. (Image) Boswell stated that his measurements of 14 cm (5.5 inches) from the ear and shoulder properly locate the wound, and these are inconsistent with a wound at the third thoracic vertebra. Moreover, all three Bethesda doctors would authenticate for the HSCA autopsy photographs showing an entry wound at the level of C6 (the sixth cervical vertebra, at the base of the neck), which is the entry level as determined by the HSCA investigation on the basis of photographic and X-ray evidence from the autopsy. Later federal agencies such as the Assassination Records Review Board criticized the autopsy on a number of grounds including destruction of the original draft of the autopsy report and notes taken at the time of the autopsy, and failure to maintain a proper chain of custody of all of the autopsy materials. After being prepared for a funeral, the President's body was then brought back to the White House and placed in the East Room in a closed casket for 24 hours, but was privately and briefly viewed during this time by the Kennedy family and some close friends. The Sunday following the assassination, his flag-draped closed casket was moved to the Capitol for public viewing. Throughout the day and night, hundreds of thousands lined up to view the guarded casket. Representatives from over 90 countries, including the Soviet Union, attended the funeral on November 25 (which was his son's third birthday). After the service, the casket was taken by caisson to Arlington National Cemetery for burial. No radio or television stations broadcast the assassination live because the area through which the motorcade was traveling was not considered important enough for a live broadcast. Most media crews were not even with the motorcade but were waiting instead at the Trade Mart in anticipation of Kennedy's arrival. Those members of the media that were with the motorcade were riding at the rear of the procession. Dealey Plaza, with Elm Street on the right - and the underpass in the middle. The last shot struck JFK´s head in front of the white pergola building on the right, and in the position between the street lamps on either side of the street. Looking in a southerly direction, with the white pergola and the knoll behind the photographer. The X on the street marks the position of the final head shot. Photo taken July, 2006. However, Kennedy's last seconds traveling through Dealey Plaza were recorded on silent 8 mm film for the 26.6 seconds before, during, and immediately following the assassination. This famous film footage was taken by garment manufacturer and amateur cameraman Abraham Zapruder, in what became known as the Zapruder film. It is famous to the general public for an appearance of the president's head to be moving backward and to his left after the last bullet struck him. Stills from the film were published by Life magazine shortly after the assassination and there were repeated, but heavily edited, showings on television starting in 1970. Zapruder was not the only one who photographed or filmed at least part of the assassination. Bystanders with still or motion cameras included Robert Hughes, Orville Nix, Charles Bronson, Elsie Dorman, Tina and Jim Towner, Philip Willis and Mary Moorman. The lone professional in Dealey Plaza who was not in the press car was Ike Altgens, photo editor for the Associated Press in Dallas. An unidentified woman, nicknamed the Babushka Lady by researchers, might have been filming the presidential motorcade during the assassination because she was seen apparently doing so on film and photographs taken by the others. There have also been attempts to recreate the events that took place during the assassination. A Dallas radio station KBOX-AM recreated the sounds of the shooting on a Long playing record and it released the record album with excerpts of news coverage of that day, but it was not an original recording of the shooting. In 2003, ABC News re-created the motorcade route and assassination using computer renderings and models. The computer re-creation was based on footage from all currently available video recordings of the assassination in a news documentary called " Peter Jennings Reporting: The Kennedy Assassination-Beyond Conspiracy." Just before the 1964 presidential election, President Johnson ordered the Warren Commission documentations to be sealed against public availability for 75 years (until 2039). However, in 1992 Congress enacted the President John F. Kennedy Assassination Records Collection Act of 1992. Congress questioned the legitimate need for continued protection of such records after three decades of secrecy. The purpose of the Act was to gather and accelerate the public release of assassination related documents. The Act requires all documents related to the assassination that have not been destroyed to be released to the public by no later than 2017. An undeterminable percentage of CIA, FBI, Secret Service, National Security Agency, State Department, US Marine Corps, Naval Investigative Service, Defense Investigative Service, and many other US government documents. On May 19, 2044, the 50th anniversary of the death of Jacqueline Kennedy Onassis, if her last child has died, the Kennedy library will release to the public a 500-page transcript of an oral history about John F. Kennedy given by Mrs. Kennedy before her death in 1994. After arresting Oswald and collecting physical evidence at the crime scenes, the Dallas Police held Oswald at the police headquarters for interrogation. Oswald was questioned all afternoon about both the Tippit shooting and the assassination of the President. Oswald was questioned intermittently for approximately 12 hours between 2:30 p.m., on November 22, and 11 a.m., on November 24. . Throughout this interrogation Oswald denied any involvement with either the assassination of President Kennedy or the murder of Patrolman Tippit. Captain Fritz of the homicide and robbery bureau did most of the questioning, but he kept no notes at the time. Days later he wrote notes of the interrogation from memory. There were no stenographic or tape recordings. Representatives of other law enforcement agencies were also present, including the FBI and the U.S. Secret Service and occasionally participated in the questioning. During the evening of November 22, the Dallas Police Department performed paraffin tests on Oswald's hands and right cheek in an apparent effort to determine, by means of a scientific test, whether Oswald had recently fired a weapon. The results were positive for the hands and negative for the right cheek. However, due to the unreliability of paraffin test, the Warren Commission did not rely on the results of the test in making their findings. Oswald provided little information during his questioning. Frequently, however, he was confronted with evidence which he could not explain, and he resorted to statements which were found to be false. Dallas authorities were not able to complete their investigation into the assassination of Kennedy due to interruptions from the FBI and the murder of Oswald by Jack Ruby. The FBI was the first authority to complete an investigation. On November 24, 1963, just hours after Lee Harvey Oswald was murdered, FBI Director, J. Edgar Hoover, said that he wanted "something issued so we can convince the public that Oswald is the real assassin." On December 9, 1963, only 17 days after the assassination, the FBI report was issued and given to the Warren Commission. Then, the FBI stayed on as the primary investigating authority for the commission. The FBI stated that only three bullets were fired during the assassination; that the first shot hit President Kennedy, the second shot hit Governor Connally, and the third shot hit Kennedy in the head, killing him. The FBI stated that Lee Harvey Oswald fired all three shots. The Warren Commission agreed with the FBI investigation that only three shots were fired, but disagreed with the FBI report on which shots hit Kennedy and which hit Governor Connally. The FBI report claimed that the first shot hit President Kennedy, the second shot hit Governor Connally, and the third shot hit Kennedy in the head, killing him. In contrast, the Warren Commission concluded that one of the three shots missed, one of the shots hit Kennedy and then struck Connally, and a third shot struck Kennedy in the head, killing him. The Federal Bureau of Investigation adequately investigated Lee Harvey Oswald prior to the assassination and properly evaluated the evidence it possessed to assess his potential to endanger the public safety in a national emergency. The Federal Bureau of Investigation conducted a thorough and professional investigation into the responsibility of Lee Harvey Oswald for the assassination. The Federal Bureau of Investigation failed to investigate adequately the possibility of a conspiracy to assassinate the President. The Federal Bureau of Investigation was deficient in its sharing of information with other agencies and departments. The FBI has received added scrutiny by Kennedy assassination researchers due to the actions of FBI agent, James Hosty. Hosty appeared in Oswald's address book. The FBI provided, to the Warren Commission, a typewritten transcription of Oswald's address book, in which Hosty's name and phone number were omitted. Two days before the assassination, Oswald went to the FBI office in Dallas to meet with Hosty, and when he found that Hosty was not in the office at the time, Oswald left an envelope for Hosty with a letter inside. After Oswald was murdered by Jack Ruby, Hosty's supervisor ordered Hosty to destroy the letter and he did so by tearing the letter up and flushing it down the toilet. Months later, when Hosty testified before the Warren Commission, he did not disclose his connection with Oswald. This information only became public much later. The first official investigation of the assassination was established by President Lyndon B. Johnson on November 29, 1963, a week after the assassination. The commission was headed by Earl Warren, Chief Justice of the United States and became universally (but unofficially) known as the Warren Commission. In late September 1964, after a 10 month investigation, the Warren Commission Report was published. The Commission reported that it could not find any persuasive evidence of a domestic or foreign conspiracy involving any other person(s), group(s), or country(ies), that Lee Harvey Oswald acted alone in the murder of Kennedy, and that Jack Ruby acted alone in the murder of Oswald. The theory that Oswald acted alone is also informally called the Lone Gunman Theory. The commission also concluded that only three bullets were fired during the assassination, and that Lee Harvey Oswald fired all three bullets from the Texas School Book Depository behind the motorcade. The Commission also laid out several scenarios concerning the timing of the shots, but the "Commission concluded . . . that the three shots were fired in a time period ranging from approximately 4.8 to in excess of 7 seconds. the last shot to hit anyone struck Kennedy in the head, fatally wounding him. It noted that three empty shells were found in the sixth floor in the book depository, and a rifle identified as the one used in the shooting - Oswald's Italian military surplus 6.5x52 mm Model 91/38 Carcano - was found hidden nearby. The Commission offered as a likely explanation that the same bullet that wounded Kennedy also caused all of Governor Connally's wounds. This single bullet then backed out of Connally's left thigh and was found on a stretcher in the hospital. This theory has become known as the " Single Bullet Theory" or, the "Magic" Bullet Theory (as it is commonly referred to by its critics and detractors). The Commission also looked into other matters beside who killed the president and criticized weaknesses in security, which has resulted in greatly increased security whenever the President travels. The supporting documents for the Warren Commission Report are not all due to be released until 2017. After the Warren Commission Report was issued, skeptics began questioning its conclusions. A multitude of books and articles criticizing the Warren Commission's findings have been published in the four decades since the Commission's report was issued. The Commission's conclusions that Oswald was the lone gunman has not gained widespread acceptance from the American public. A 2003 ABC News poll found that 70% of respondents "suspect a plot" committed the assassination of President Kennedy and 68% of those polled believed there has been an official cover-up of the assassination. . This skepticism has been shared by prominent government officials as well. In 1998 a panel led by Attorney General Ramsey Clark met in Washington, DC to examine various photographs, X-ray films, documents and other evidence pertaining to the death of President Kennedy. The Clark Panel determined that President Kennedy was struck by two bullets fired from above and behind him, one of which traversed the base of the neck on the right side without striking bone and the other of which entered the skull from behind and destroyed its upper right side . The chain of custody of the evidence on which the panel reached its conclusions has been called into question. Clark raised this issue with President Johnson. The Assassination Records Review Board said in 1998: "[T]he persons handling the autopsy records did not create a complete and contemporaneous accounting of the number of photographs nor was a proper chain of custody established for all of the autopsy materials." The U.S. President's Commission on CIA activities within the United States was set up under President Gerald Ford in 1975 to investigate the activities of the CIA within the United States. The commission was led by the Vice President, Nelson Rockefeller, and is sometimes referred to as the Rockefeller Commission. Part of the commission's work dealt with the Kennedy assassination , specifically the head snap as seen in the Zapruder film (first shown publicly in 1975), and the possible presence of E. Howard Hunt and Frank Sturgis in Dallas. Fifteen years after the Warren Commission issued its report, a congressional committee named the House Select Committee on Assassinations reviewed the Warren Commission report and the underlying FBI report on which the Commission heavily relied. The Committee believed another primary cause of the Warren Commission's failure to adequately probe and analyze whether or not Oswald acted alone arose out of the lack of cooperation by the CIA. Finally, the Committee found that the Warren Commission inadequately investigated for a conspiracy because of: "[T]ime pressures and the desire of national leaders to allay public fears of a conspiracy." The committee concluded that Lee Harvey Oswald fired three shots at President John F. Kennedy. The second and third shots he fired struck the President. The third shot he fired killed the President. The HSCA agreed with the single bullet theory, but concluded that it occurred at a time point during the assassination that differed from what the Warren Commission had theorized. Their theory, based primarily on dictabelt evidence, was that President Kennedy was assassinated probably as a result of a conspiracy. They proposed that four shots had been fired during the assassination; Oswald fired the first, second, and fourth bullets, and that (based on the acoustic evidence) there was a high probability that an unnamed second assassin fired the third bullet, but missed, from President Kennedy's right front, from a location concealed behind the Grassy Knoll picket fence. Many years after the House Select Committee on Assassinations issued its report, the attorney for the House Select Committee on Assassinations; G. Robert Blakey issued a statement to the news media calling into question the honesty of the CIA in its dealings with the Committee and the accuracy of the information given to it. The shot from the grassy knoll is not only supported by the acoustics, which is a tape that we found of a police motorcycle broadcast back to the district station. It is corroborated by eyewitness testimony in the plaza. There were 20 people, at least, who heard a shot from the grassy knoll. The sole acoustic evidence relied on by the committee to support its conclusion of a fourth gunshot (and a gunman on the grassy knoll) in the JFK assassination, was a Dictabelt recording alleged to be from a stuck transmitter on a police motorcycle in Dealey Plaza during the assassination. After the committee finished its work, however, an amateur researcher listened to the recording and discovered faint crosstalk of transmissions from another police radio channel known to have been made a minute after the assassination. Further, the Dallas motorcycle policeman thought to be the source of the sounds followed the motorcade to the hospital at high speed, his siren blaring, immediately after the shots were fired. Yet the recording is of a mostly idling motorcycle, eventually determined to have been at JFK's destination, the Trade Mart, miles from Dealey Plaza. Several years later, in 1981, a special panel of the National Academy of Sciences (NAS) disputed the evidence of a fourth shot, contained on the police dictabelt . The panel concluded it was simply random noise, perhaps static, recorded about a minute after the shooting while Kennedy's motorcade was en route to Parkland Hospital. The NAS experts, headed by physicist Norman F. Ramsey of Harvard, reached that conclusion after studying the sounds on the two radio channels Dallas police were using that day. Routine transmissions were made on Channel One and recorded on a dictabelt at police headquarters. An auxiliary frequency, Channel Two, was dedicated to the president's motorcade and used primarily by Dallas Police Chief Jesse Curry; its transmissions were recorded on a separate Gray Audograph disc machine. The conclusion by the NAS was then rebutted in 2001 in a Science and Justice article by D.B. Thomas, a government scientist and JFK assassination researcher. Mr. Thomas concluded the HSCA finding of a second shooter was correct and that the NAS panel's study was flawed. Thomas surmises that the Dictaphone needle jumped and created an overdub on Channel One. In response to Thomas's findings, Michael O'Dell concluded in his report that the prior reports relied on incorrect timelines and made unfounded assumptions that, when corrected, do not support the identification of gunshots on the recording. However, Thomas claimed those findings to be false at a conference in DC in 2005, and provided what he said was further support for evidence of at least four shots. In 2003, ABCNEWS aired the results of their investigation on a program called " Peter Jennings Reporting: The Kennedy Assassination-Beyond Conspiracy." Based on computer diagrams and recreations done by Dale K. Myers, ABCNEWS concluded that the sound recordings on the dictabelt could not have come from Dealey Plaza and that the Police Officer H.B. McLain was correct in his assertions that he had not yet entered Dealey Plaza at the time of the assassination. The Assassination Records Review Board was created by an act of Congress in 1992 to gather and preserve the documents relating to the assassination. The Assassination Records Review Board was not commissioned to make any findings or conclusions. According to the AARB, one of the many tragedies related to the assassination of President Kennedy was the incompleteness of the autopsy record and the suspicion caused by the secrecy that has surrounded the records that do exist. An official investigation by the House Select Committee on Assassinations (HSCA), conducted from 1976 to 1979, concluded that Oswald assassinated President Kennedy as a result of a probable conspiracy. This conclusion of a likely conspiracy contrasts with the earlier conclusion by the Warren Commission that the President was assassinated by a lone gunman. The perception of a conspiracy was widespread even at the time. A source considered reliable by the FBI, related that Colonel Boris Ivanov, Chief of the Soviet Committee for State Security (KGB) Residency in New York City at the time of the assassination, stated that it was his personal feeling that the assassination of President Kennedy had been planned by an organized group rather than being the act of one individual assassin. Many not only dispute the conclusion that Oswald was the lone assassin (claiming that there was a conspiracy), but also claim that Oswald was not involved at all. Shortly after his arrest, Oswald insisted he was a "patsy." Oswald never admitted any participation in the assassination, and was murdered two days after being taken into police custody. Some polls indicate a large number of Americans are suspicious of official government conclusions regarding the assassination. A 2003 ABC News poll found that 70% of respondents suspected there was an assassination plot. These same polls also show that there is no agreement on who else may have been involved. 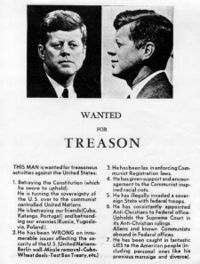 Virtually every person and organization that could have had any possible motive for the crime has been accused at one time or another of involvement in the Kennedy assassination. The motorcade consisted of numerous cars and police motorcycles. 1964 Lincoln 4 door convertible: State highway patrol officer Hurchel Jacks (driver), Agent Rufus Youngblood (right front), Senator Ralph Yarborough (left rear), Mrs. Lyndon Johnson (centre rear), Vice-President Lyndon Johnson (right rear). Every United States president elected or reelected in 20-year intervals beginning with 1840 (beginning with William Henry Harrison) had died in office (Harrison 1840, Lincoln 1860, Garfield 1880, McKinley 1900, Harding 1920, Roosevelt 1940). John F. Kennedy's assassination continued this pattern. It ultimately broke with Ronald Reagan who, elected in 1980, survived being shot in a March 1981 assassination attempt. This pattern of Presidential deaths has been referred to as Tecumseh's curse, the 20-year curse, or the zero factor. After JFK's assassination, a popular urban legend emerged—that there existed numerous similarities between Kennedy and Abraham Lincoln's assassination, namely that while Kennedy was shot by from a warehouse with the assassin escaping to a theatre, Lincoln was shot in a theatre and the assassin escaped to a warehouse and that both presidents were followed in office by men named Johnson. Kennedy's life and the subsequent conspiracy theories surrounding his death have been the topic for many films, including Mark Lane's 1966 Rush to Judgment, Executive Action in 1973, NBC TV's 1983 mini series Kennedy, Nigel Turner's 1988, 1991, 1995, and 2003's continuing documentary The Men Who Killed Kennedy, Oliver Stone's 1991 JFK, and the 1993 JFK: Reckless Youth (which looked at Kennedy's early years). In 1975, a San Francisco-based group of artists called Ant Farm reenacted the Kennedy assassination in Dealey Plaza and documented it in a video piece called " The Eternal Frame." The assassination of JFK was the focal point of an episode of the science-fiction comedy series Red Dwarf named " Tikka to Ride" when male lead Lister played by Craig Charles goes back in time to order some curry and ends up in the Texas School Book Depository, accidentally bumping Lee Harvey Oswald out the window before he fires the lethal shot that killed Kennedy. The resulting time paradox prevents Lister and his crewmates from returning to their own time, so Lister makes contact with the now impeached Kennedy a few years later after the failed assassination attempt. Lister convinces Kennedy that the best interests of the United States and the future are served by his death, so Kennedy goes back in time with Lister to be the infamous second shooter behind the grassy knoll. The assassination is successful and shortly afterwards Kennedy the shooter vanishes. In the TV series Twilight Zone (1985) episode " Profile in Silver", a time traveller whose mission is to film the assassination loses his detachment and prevents Kennedy's death. The result is an escalating series of natural disasters, as the universe tries to "heal" itself. The time traveller resolves the paradox by sending Kennedy forward to his own era, and by taking Kennedy's place in the motorcade, dying in his stead. In an two hour episode of the TV series Quantum Leap, in the episodes named Lee Harvey Oswald' which aired September 22, 1992, Sam Beckett jumps into the body of Lee Harvey Oswald at various times in his life. It appears that the two minds are merging, as Sam's contact with PQL, Al, tries to bring back Sam before he becomes Oswald and actually assassinated Kennedy instead of Oswald. Near the end Sam jumps from Oswald just before he pulled the trigger to assassinate the President, to the Secret Service Agent at the rear of the limo carrying the President, who grabs Mrs. Kennedy and pulls her back into the limo. It is then revealed that Sam was sent back to save Mrs. Kennedy, who was also killed in an alternate history, which was relayed by Al before Sam leaps out to his next adventure. The 2002 film Interview With the Assassin presents the assassination and resultant conspiracy theories in mock documentary fashion, with a terminally-ill former Marine named Walter Ohlinger who claims that he was the second gunman behind the fence on the grassy knoll.